Conceived as a successor to the Spitfire, the Type 371 was projected from November 1942, initially mating a laminar flow wing with a Griffon-engined Spitfire XIV and progressively embracing a new fuselage. Three prototypes were ordered to Specification F.1/43, which was written around the project, and the first of these flew on 30 June 1944. 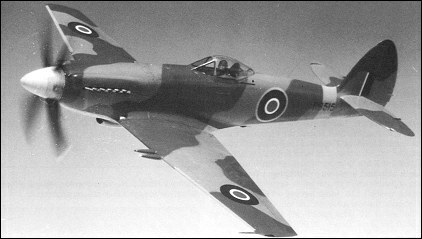 This prototype comprised a Spitfire XIV fuselage with the new wing, a 2,035hp Rolls-Royce Griffon 61 engine and an armament of four 20mm cannon. Named Spiteful, the second prototype flew on 8 January 1945 with the new fuselage, an all-round vision cockpit canopy and a 2,375hp Griffon 69 driving a five-bladed propeller. Production orders were placed for 188 Spitefuls, but only 16 were flown of 19 built or partially-completed (from April 1945) as the end of World War II and the advent of the jet fighter terminated plans for RAF use of the Spiteful. The designation F Mk 14 was applied to the Griffon 69-powered Spiteful; the proposed F Mk 15 had either the Griffon 89 or 90 with a six-bladed contraprop, and a single F Mk 16 had a Griffon 101 with a three-speed supercharger and five-bladed propeller. airfoiltools.com have a root and tip wing profile for the Supermarine 371 wing. Thickest at 40-50% of chord. As is usual for us brits it took us a while but we got there just a bit late. Bill Schultz I think has a picture of an MB5 a Martin Baker aircraft the air ministry chose to ignore. An even more extremely late reply to Bill Schultz's question. Have you checked out the Martin Baker MB5 ? An extremely late reply to Bill Schultz's question. Did you look up the Supermarine Seafang - a navalised version of the Spitful with counter-rotating props and a chin air intake, much as you described. Google images and the Imperial War Museum website has a picture that may either confirm or deny any suspicion. Late reply to Bill Schultz. Your description could fit the Commonwealth Aircraft CA 15 Kangaroo, except I can't find any reference to it's being fitted with contra rotating props! Have a look here:- http://en.wikipedia.org/wiki/CAC_CA-15. Nice design, even though it's the spit really - yeah, amazing it reached 494 mph! I am intending to produce an illustration of this aircraft and would be grateful for any imagery and/or information about it and its development. Have done a few contra rotating prop spits (Mk21 variant and Mk47) so would in particular love to illustrate this particular version too. Bill: the photo you have seems to be of a Martin Baker MB5 a prototype fighter of 1944. Problem: I have a photo of what appears to be Spiteful F M15...but...the oil/coolant cooler intake is ala Mustang...located on the underside of the fuselage aft of the cockpit. Do you have any ideas on what the configuration is designated or where I might find details of such a configuration..
Good chance it is a one-off but I really want to properly identify this photo.There are no cannons installed so it might be a test article. I have tried searching most of the websites re Spitfires and none show both the contra-rotating props and the large aft mounted oil/coolant cooler. What a beatiful airplane. Along with CA-15 two of the greatest piston prop aircraft ever conceived. Although P-51H and proposed xp-72(variant of P-47) which was exspected to top 540mph! and F8F Bearcat(legendary climbing ability) should be considered. This airplane is simply georgeous. Where are the remaining airframes. The Griffons have probably been used up.